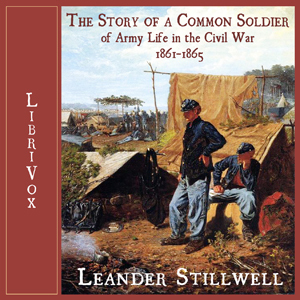 Leander Stillwell was an 18-year-old Illinois farm boy, living with his family in a log cabin, when the U.S. Civil War broke out. Stillwell felt a duty "to help save the Nation;" but, as with many other young men, his Patriotism was tinged with bravura: "the idea of staying at home and turning over senseless clods on the farm with the cannon thundering so close at hand . . . was simply intolerable." Stillwell volunteered for the 61st Illinois Infantry in January 1861. His youthful enthusiasm for the soldier's life was soon tempered at Shiloh, where he first "saw a gun fired in anger," and "saw a man die a violent death." Stillwell's recounting of events is always vivid, personal, and engrossing. "I distinctly remember my first shot at Shiloh . . . The fronts of both lines were . . . shrouded in smoke. I had my gun at a ready, and was trying to peer under the smoke in order to get a sight of our enemies. Suddenly I heard someone in a highly excited tone calling to me from just in my rear, --'Stillwell! Shoot! Shoot! Why don't you shoot?' I looked around and saw that this command was being given by . . . our second lieutenant, who was wild with excitement, jumping up and down like a hen on a hot griddle. 'Why, lieutenant,' I said, 'I can't see anything to shoot at.' 'Shoot, shoot, anyhow!' 'All right,' I responded. . . And bringing my gun to my shoulder, I aimed low in the direction of the enemy, and blazed away through the smoke. But at the time the idea to me was ridiculous that one should blindly shoot into a cloud of smoke without having a bead on the object to be shot at."